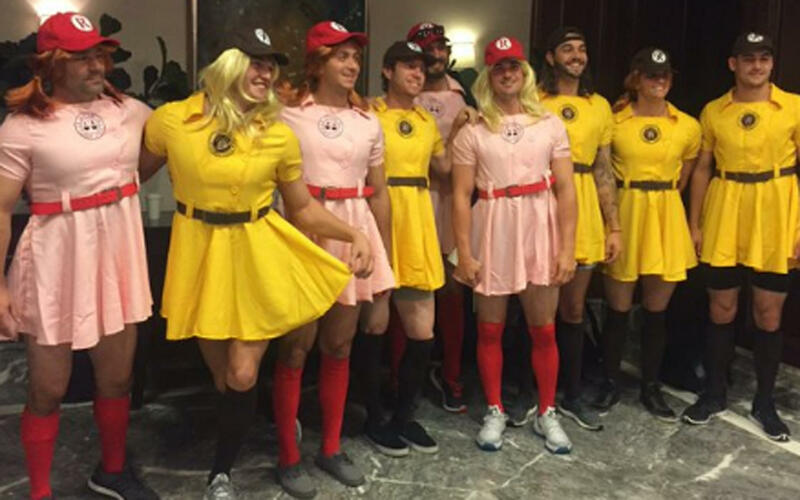 NEW YORK -- That baseball hazing ritual of dressing up rookies as Wonder Woman, Hooters Girls and Dallas Cowboys cheerleaders is now banned. Exactly when the annual dress-up day began around the majors isn’t quite clear. Players often considered it a form of bonding, and it’s become more of a production in recent years. Not all outfits are banned - superheroes such as Batman and Spider-Man are OK.
CBSSports.com’s R.J. Anderson writes, “Obviously, there are going to be those who bemoan the change -- citing how the whole world has gotten too sensitive or whatever. But what’s the defense of using a woman’s image or clothing to demean -- and if the intent is not to embarrass or belittle, then what is the intent? There are a million ways to rib young players if that’s your sort of thing -- there’s no justification for having to put down a gender to do it. The issue of locker room bullying erupted a few years ago when an NFL investigation found Richie Incognito and two other Miami Dolphins engaged in persistent harassment toward teammate Jonathan Martin. In 2012, Harper and Nationals newcomers wore red leotards in the style of Gabby Douglas and the U.S. women’s gymnastics team for a train ride to New York - veteran Washington pitcher Gio Gonzalez tweeted a photo. After he was traded to the Mets in 1992, Jeff Kent threw his pimp’s costume to the floor in the visitors’ clubhouse in Montreal and demanded his regular clothes - which contained the ID he needed to go through customs - be returned. Last year, the Cardinals and Dodgers made their newcomers walk across the street from Wrigley Field - in their full uniforms - to bring back coffee before a game against the Cubs. But requiring players “to consume alcoholic beverages or any other kind of drug, or requiring the ingestion of an undesirable or unwanted substance (food, drink, concoction)“ is banned under the new collective bargaining agreement.